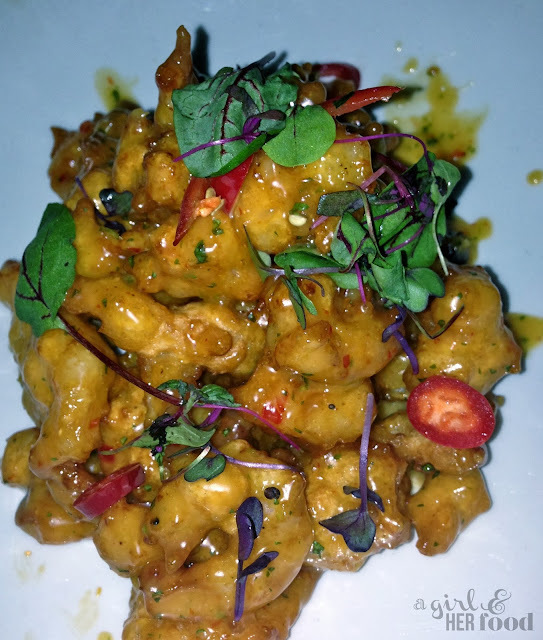 Next time you are in the mood for a classic Chicago seafood and steak house type meal, expand your horizon beyond Joe’s, Gibson’s, Hugo’s, Mastro’s, etc., and check out Fulton’s on the River. Last week, Fulton’s invited Steve and me to enjoy a date night at their restaurant, and it did not disappoint. Although we were hoping to enjoy spectacular city views dining alfresco on the river, Mother Nature didn’t cooperate. Regardless, we had a great time inside, where you can still enjoy wonderful city views. Fulton’s has all the classics one would expect from reputable Chicago seafood and steak house, and more, including an impressive wine list. However, they expand beyond just the classics and offer some more modern and creative takes on food as well. We got started by ordering the firecracker shrimp appetizer. I highly recommend it and it was a great way to start our meal. For the main course, Steve went classic. 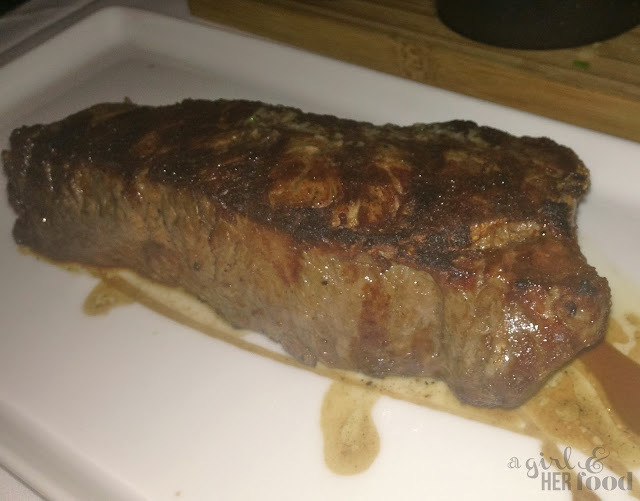 A big juicy 16 oz prime NY Strip Steak, served a perfect medium-rare. He commented it was as good as any steak he has had in the city, and was really satisfied. For sides, we took advantage of the flight, which allows you to choose 3 of approximately dozen or so sides they serve. We chose the creamed spinach, mashed potato, and the crispy polenta. They bring down the portion size of the sides when you order the flight, and it was nice to be able to order and taste several sides, even know we were only a party of 2. For my entrée, I decided to go a bit more out of the box, and chose the “Butcher's Trio”. This dish was really fun to eat, and consists of 3 cuts (fish or meat) paired with 3 wines. The first part of the Butcher's Trio was a seared scallop with corn anglaise, fresh herbs, and pickled beets. Fulton’s paired it with a delicious German Gewürztraminer from Germany. Next, they brought out a pheasant ballontine, served with Rubuchon potatoes and truffle gravy. It was rich and so tasty. They paired that with a chilled rose of Malbec Crios from Mendoza, Argentina. For the final tasting, they brought me braised pork belly with kimchi puree. It was paired with a Burgundy Pinot Nior. The portions of each component of the butcher’s trio were perfect. The butcher’s trio was big enough to offer Steve a tasting too. It's only available until the end of October, so hurry in to try it! We didn’t do desert, but they look to have some really great offerings. Hope you enjoy when you go!